Winger Tim Visser insists Scotland are only thinking about beating South Africa and rejects the notion that the side is weakened by 10 changes. 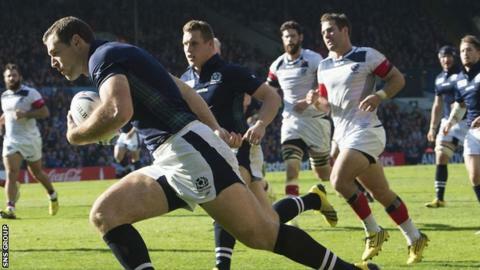 The Scots can reach the World Cup quarter-finals with a victory at St James' Park on Saturday. "In a World Cup you don't go out half-hearted to get through to the next game," said Visser. "I don't think any coach puts out a second string squad to do that against South Africa." Stuart Hogg continues at full-back and will be the only player to start the first three Pool B matches for Scotland. Fly-half Finn Russell is absent through injury and flanker John Hardie is not being risked after suffering a head knock in the opening win over Japan. Impressive performers Sean Maitland and Mark Bennett are left out, while experienced front-row duo Ross Ford and Alasdair Dickinson are on the bench. Gordon Reid, Richie Vernon, Sam Hidalgo-Clyne and Blair Cowan, who was called up in place of the injured Grant Gilchrist, are all in the match-day 22 for the first time at the tournament. "We've had three games in 10 days and the squad has been selected with 31 players to do the job," added Visser, a try-scorer in the win over USA. "We're expecting everyone to perform and we're going out to win the game tomorrow." Scotland top the group after two bonus-point victories, while the Springboks recovered from a surprise loss against Japan to demolish Samoa. The big-hitting Pacific Islanders are Scotland's final opponents before the knockout phase of the tournament. But Visser is only focused on the task ahead in Newcastle. "South Africa are a physical team and that generally comes out in the forwards because that's the way they like to play. But they have quality throughout the team," added the 28-year-old. "They've got a world class set of backs and some young players have come through really well recently. "They have a world class finisher in Bryan Habana as well, so they are incredibly dangerous. We'll keep an eye on Willie le Roux at the back as well - he's a handy player." South Africa: Willie le Roux; JP Pietersen, Jesse Kriel, Damian de Allende, Bryan Habana; Handre Pollard, Fourie du Preez (captain); Tendai Mtawarira, Bismarck du Plessis, Jannie du Plessis; Eben Etzebeth, Lood de Jager; Francois Louw, Schalk Burger, Duane Vermeulen. Replacements: Adriaan Strauss, Trevor Nyakane, Frans Malherbe, Pieter-Steph du Toit, Willem Alberts, Ruan Pienaar, Pat Lambie, Jan Serfontein. Scotland: Stuart Hogg, Tommy Seymour, Richie Vernon, Matt Scott, Tim Visser, Duncan Weir, Greig Laidlaw, (capt), Gordon Reid, Fraser Brown, Willem Nel, Richie Gray, Jonny Gray, Josh Strauss, Blair Cowan, David Denton. Replacements: Ross Ford, Alasdair Dickinson, Jon Welsh, Tim Swinson, Ryan Wilson, Sam Hidalgo-Clyne, Peter Horne, Sean Lamont.